Garlic fries are one of the tastiest fries I've ever eaten that I've never had at a restaurant. I'm not sure where I could go around here to find some, but why bother when I can make them just as easily myself! Most complaints with oven roasted fries is that they don't get as crispy as regular french fries. After looking around and remembering a process I tried earlier, I settled on my version that produces really crispy fries with a garlicky topping made by infusing oil with minced garlic. This method requires that the potatoes, sliced into 1/4-inch sticks (peeling isn't necessary), are briefly boiled in water and patted dry. Boiling them sort of jump starts the cooking process so that the outsides cook along with the insides, and it seems to make them crispier, though that could just be how they are roasted. Minimal oil is added to the potatoes, just enough to coat them lightly, but enough so that they crisp without sitting in a pool of grease. The oven temperature is quite high, and the cooking racks are placed at the highest and lowest position inside the oven. The baking sheets are rotated between the top and the bottom for 15 minutes at a time until the potatoes take on a uniformly roasted and crispy appearance. With a little extra preparation and attention to timing, you can serve these alongside hamburgers, or just as a snack to munch on whilst movie watching. Preheat oven to 475°, making sure the oven racks are at the lowest and highest position. Heat a pot of water to a boil with 1 teaspoon salt. Have ready two large baking sheet lined with paper towels. In a small saucepan, heat garlic and oil together for 2 minutes. Strain the garlic from the oil and set both aside. In batches, boil potato matchsticks in water for 1 minute; remove with a slotted spoon and drain on baking sheet. Repeat with remaining potatoes until all have been boiled, making sure the potatoes have been patted dry. Divide potatoes among two baking sheets and toss each batch with 2 tablespoons oil, 3/4 teaspoon kosher salt, and 1/4 teaspoon black pepper. Place both sheets in the oven and set the timer for 15 minutes. When the time's up, remove both sheets and carefully toss the potatoes. Switch sheets so that the sheet on top is now on the bottom and the bottom sheet is on top. Set the timer for 15 minutes. Repeat process until the potatoes look fairly uniformly roasted and crispy. 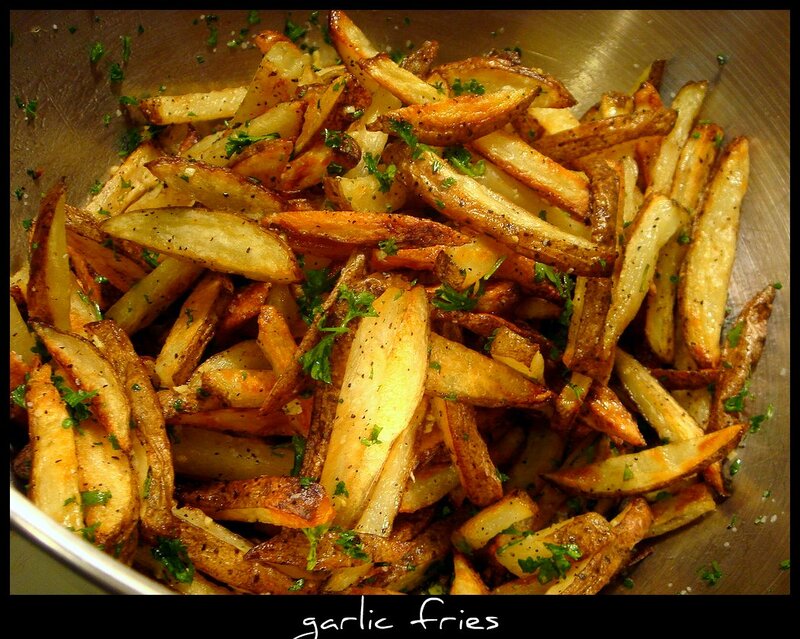 After removing sheets from oven, place the fries in a large bowl and toss with the parsley, reserved garlic, and more salt if required. ooh, those sound incredibly yummy!!! I've never boiled before the bake... good idea, I'll have to try that! I like to read it. Great effort by the author, really appreciative work.. I hope every one in future will adopt your information. especially to those who have high blood pressure.